(Photo: LWF / Kenya-Djibouti)Graduates with diploma at Masinde Muliro University of Science & Technology graduation ceremony. Graduating with a diploma in primary education is a special achievement after spending 23 years in a refugee camp in the north east of Africa. Holding a university degree makes Alemsahay, a refugee feel confident and stronger, she told Lutheran World Information. "At the beginning of the course, I wasn't very sure I will make it. The curriculum taught in English appeared complex and loaded but I believe my persistent efforts with support from God have made me thrive," she says. 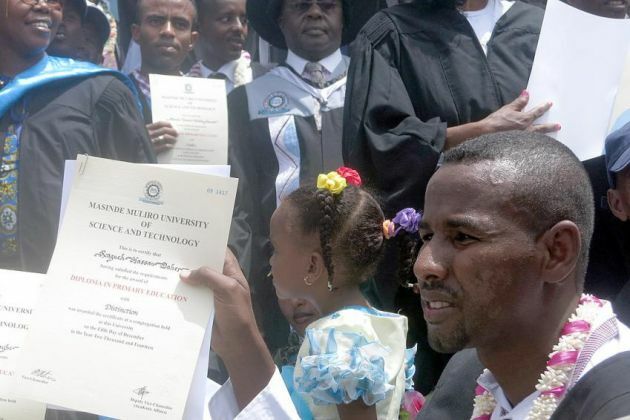 She was one of 40 refugees in Djibouti who graduated with a diploma in Primary Education from Masinde Muliro University of Science & Technology, a Kenya-based university, Lutheran World Federation reported March 6. All of them are refugee teachers in Ali Addeh and Hol Hol camps, Djibouti, where The Lutheran World Federation assists with education and child protection. "My dream of being role model for my three daughters has finally come to pass," says Alemsahay who is now aged 40. She was one of 40 refugees in Djibouti who graduated with a diploma in Primary Education from Masinde Muliro University of Science & Technology, the LWF reported on March 6. All of them are refugee teachers in Ali Addeh and Hol Hol camps, Djibouti, where LWF assists with education and child protection. Alemsahay came to Ali Addeh refugee camp in 1992 at the age of 17 years. She had just completed grade 12 in school. "I joined LWF as pre-school teacher in 2011; I believe that this opened the door for me and gave me this great opportunity to develop my skills and knowledge in the teaching profession," she said. "Being a teacher was the turning point in my life, an opportunity that has brought me to where I am today". "What fuelled my resolve further was the faith my three daughters had in me. They expected me to succeed in life so that I could be their role model, provide for them and secure their future." "My first born in grade 8 at Wadajir Primary school in Ali Addeh refugee camp has already set his mind focused on becoming a graduate in the next 5 years to beat me," she says. "It was absolutely fantastic to be there and see how the whole refugee community supported the graduates, and how children saw their teachers be recognized as 'real teachers'," Lennart Hernander, LWF Country representative for Kenya-Djibouti, said. "We are certain that there were many among the refugees who thought: I also want to go to University and graduate. They can do it, I can do it!" UNICEF along with the (Lutheran) Church of Sweden and the Swedish International Development Cooperation Agency have been the main funding partners for the project. "We also want to mention our Education Technical Advisor Hellen Choge and former Senior Education Officer now Project Coordinator in Kakuma, Collins Onyango who are the two who planted the seeds for this program when they both worked in LWF Kakuma in 2009," Hernander notes. After the successful completion of her course, Alemsahay began saving money to construct a classroom in her compound of the refugee camp. She wants to help the mothers in her section to learn, because she is convinced that "educated women are the key to development in the community and to peace for a world full of conflict." She believes that education helps women grasp opportunities which will benefit them and their families, preparing them for the labor market and help them understand their civil and reproductive rights. "Everyone is intelligent and has the potential to learn," she concludes. The LWF is assisting refugees from Somalia and South Sudan in Kenya and its northern neighbor Djibouti with education, child protection, assistance to people with special needs and community services.